Why The Hell Are Quebec Comedians Wearing Blackface? Quebec comedians have a strange affliction. It sporadically resurfaces time and again and it's proven almost impossible to cure. The affliction in question is the Quebec comedy scene's' sick, inexplicable obsession with blackface. Last Sunday it exposed itself yet again. Quebec comedians have a strange affliction. It sporadically resurfaces time and again and it's proven almost impossible to cure. No one really understands where the resistance to its cure (that being education) comes from. Some have come to suspect that it is self-inflicted; that somehow, they do not want to be cured, that they enjoy wafting in the stench of their ignorance. The affliction in question is the Quebec comedy scene's' sick obsession with blackface. Last Sunday it exposed itself yet again. This time the incident unfolded on the national scene before the annual comedy award show, Gala Les Olivier. This show, which airs on Radio-Canada (french version of CBC, Canada's national public broadcaster and a Crown corporation), garners over 1 million viewers. It's a pretty big deal in Quebec. 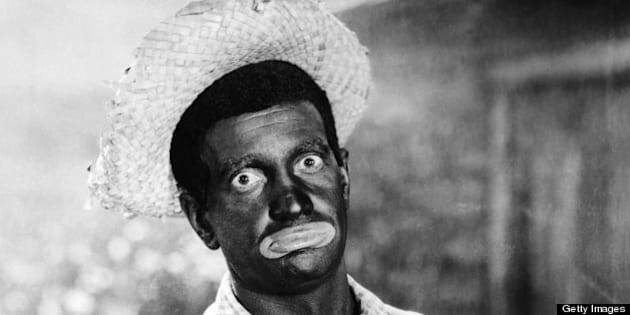 In the opening sketch, the host Mario Jean wore blackface in an attempt to impersonate a Black comedian. To add insult to injury, the following caption appeared: "We are all part of the family of comedy". As a Black Quebecer, born and raised in Montreal, witnessing the recurring obsession with ridiculing people of colour in my province is baffling and extremely unnerving. Before you balk and brush off the significance of this peculiar ailment afflicting Quebec society, take a look at this slideshow. I dug this up in less than 10 minutes. You gotta ask yourself: do Quebec humourists have a blackface fetish? Wait, let me stop you before you pull the ignorance card to defend this racist practice. This ignorance card is too easily played in Quebec. Instances of racism under the guise of comedy have struck far too many times. In 2008, again on Radio-Canada, we heard a "comedian" make this "joke" about the election of Barack Obama as the first African American President of the USA: "We (Americans) are not racist, having a n***** in the White House will do us some good, Black on White is easier to shoot!" Can you imagine hearing this anywhere else in the world? On a national, public broadcaster?! Even Fox wouldn't have aired it! Without going into a the history of blackface and why seeing it on a public funded television show is utterly unacceptable, let me give you a little taste of my experience as a person of colour born in Quebec. - Being asked where I'm from -- "No, like, really really from" -- after I answer that I'm from Montreal. - Learning in high school curriculum that Black people made only a small cameo in the history book under the topic of slavery covered in half a class. And this despite the fact that the Black presence on this land predates that of Europeans on this land. - Experiencing a reluctance to watch Quebecer movies or tv series out of fear of hearing the gratuitous drop of the n-word or other racist epithets. Or even hoping that no Black character is written into a script because they often only appear to embody negative stereotypes. - Hearing the rebuttal, "It's not racist, [insert their single Black friend's name here] says it's funny", as if Black people cannot fall prey to bigotry. - Seeing the topic of racism become a taboo: In Quebec very little space is allotted for people other than francophone Quebecers to denounce discrimination. Often when Quebecers of colour speak out, active attempts are made to silence them through hostility, indifference, or ridicule. - Learning that not every male of driving age gets pulled over because they "look" like a omnipresent suspect [cough]racial profiling[cough]. I really hope they catch that guy one day. - The employment inequity faced by people of colour in this country. I could really go on and on, but I'll stop here. So in light of these facts, you can imagine how difficult it is to "appreciate" the purported comedic relief that is blackface. Quebec comedians, this is an intervention: Stop wearing Blackface. It is never funny and always inappropriate. Look around you, you're the last ones left at that party.